Part 3 of the Hottest 100 segment is upon us. I've tried at least 1 beer from each decade, for a third time, and have written short summations for you below. Assuming things go to plan, ie. I can find all the beers in time, I intend to complete this challenge in 10 posts. #10 - Feral Karma Citra This beer has finally made the big time! Feral's Karma Citra was their first ever GABS beers; in the days when it was just a 20 tap event at The Local Taphouse! Last year it finally made the jump from sporadic appearer to year round core range member! This beer straddles the divide of appeal between being approachable to craft beer novices, while still appealing to aficianado's. For those who haven't tried it; please do! It's body is lightly roasted with hints of nuttiness, while still allowing the Citra hops to shine. It's a wonderful Black IPA that I really hopes makes the style more widely available! #16 - Big Shed Golden Stout Time Big Shed's GABS offering was one of the beer I voted for in last years Hottest 100 countdown. Their beer; Golden Stout Time, a take on Australia's best ice cream - the Golden Gaytime - was simply superb! It had the perfect mix of chocolate, honeycomb and caramel, that blended perfectly with the creamy texture of the beer. In short they nailed it! I really hope these guys keep making this beer long into the future; it's one of the best Sweet Stouts on the market! #26 - Riverside 777 Quite how this beer slipped this low I'm not sure! It could be that it is hard to get outside it's home state of NSW - although thankfully that is changing! Riverside's 777 could go toe-to-toe with any Imperial IPA. It's, not surprisingly, packed full of hops - both tropical and piney in flavour - while there is a more than adequate malt base that allows them to shine. For 9.2% ABV, it's dangerously easy drinking! I'm going to try and organise a side by side of this beer and the Pirate Life IIPA (3rd in this very same countdown) and report back my findings. #35 - 4 Pines Indian Summer Pale Ale 4 Pines released this beer, their first - and to date only - canned offering, at the start of last summer. Quite how this beer ended up this high in the countdown beguiles me. It's an inoffensive Pale Ale, with relatively low carbonation, malt flavour and hop flavour. What little flavour there is, is of light breads malts and some passionfruit. I can see the appeal of this beer, on a 35+ degree day by a pool - but frankly there are far better options available at the same price point. 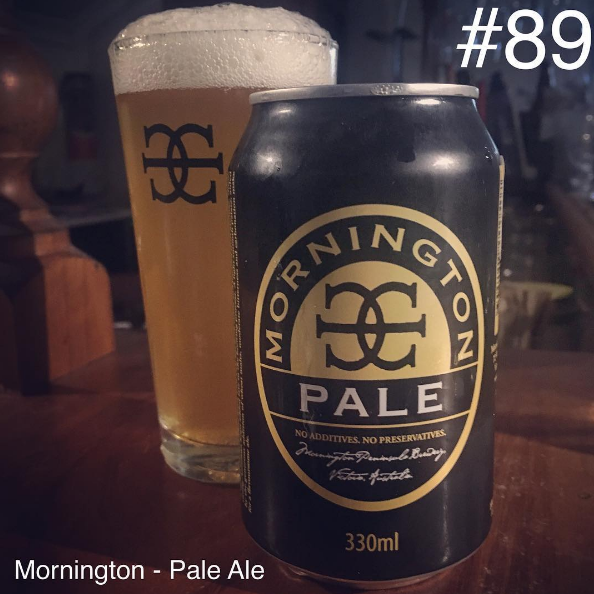 Most beers I can find a way to endorse their standing in the Hottest 100 beers - but #35 is far far too high for this beer, so lacking in flavour. There's a time and a place; and the Hottest 100 is certainly not the place! #46 - Feral Tusk This one is really stretching back some time! Feral Tusk is the beer I most look forward to every year. It's a massive Imperial IPA, released on tap just twice a year at select venues around the country. The beer has a huge caramel malt base, as you'd expect for such a big Imperial IPA (11.8%), before an avalanche of hops attack your senses with pine and tropical fruit flavour dominating. It's a wonderful IPA, that's dangerously drinkable! Every year I wonder how this beer ends up this far down the countdown, but then I think that 46th isn't bad for a beer that is available for less than one week a year! #66 - White Rabbit Pale Ale Unlike most Australian brewers, White Rabbit's Pale Ale isn't American/Australian in style; it's Belgian. I was unsure what to think when they announced their Belgian Pale Ale in July 2014(ish) - Australian's always rave about Belgian beers, but could White Rabbit reproduce that flavour and capture that market. Clearly they've done pretty well - with this beer finding it's way up from #85 in it's first year. The beer is a simple Belgian Pale Ale with nice Belgian yeast phenols and flavours. There's light citrus and floral qualities from the hops that are quite nice as well. It's certainly not going to standup to the best Belgian examples but it is more than serviceable. I quite like this beer and hope it sparks a trend that more Aussie brewers experiment with different yeasts. 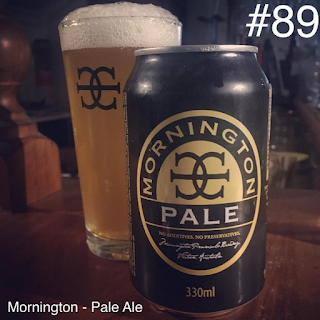 #89 - Mornington Pale Ale In contrast to the Yenda offering, Mornington's exceptional Pale Ale somehow slotted in a whole 10 places lower in the countdown. It's a beautifully constructed Pale Ale, with a light biscuity malt platform allowing the passionfruit and citrus aromas and flavours of the hops to shine! I drink this beer regularly and can only imagine that other people aren't drinking it if it was to slip this far down the countdown. These guys are exporting to China so you should be able to find it throughout most of Australia. #97 - Coopers Sparkling Ale It had been years since I last tried a Coopers Red! I was so pleased to see this sneak into the Hottest 100 so I could reminisce a bit. It tasted similar to what I recall - with pale malts and some distinct yeastiness. There's more citrus hops than I remembered, but they aren't particularly bitter. It was a wonderful trip down memory lane - and it certainly won't be years until my next one!